Chemical testing within fume hoods or fume cupboards requires specialized materials within the fume hood superstructure to resist attack from harsh chemicals. 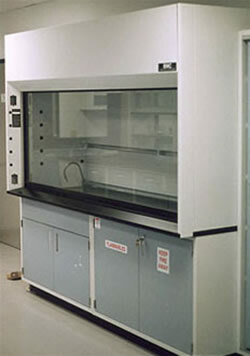 The components of fume hoods are typically epoxy resin countertops or work surfaces with dished area for spill containment and equally as important, the Fume Hood liner materials in the side and back walls and the baffle areas. Total Lab Solutions now offers unfabricated white liner board sheets in a size of 48" x 96" (1219 x 2438 mm) or fabricated to required sizing. Dura-Liner (DuraLiner) isn integrally white, corrosion and flame resistant fiberglass reinforced polyester resin (poly resin FRP) boards. These panels are typically offered in 3/16" (4.76 mm) or 1/4" (6 mm) thickness. Fume hoods and acid storage cabinets are primary applications that benefit greatly from the superior properties of white FRP Dura-Liner. Dura-Liner products are UL certified and are produced at an ISO 9001 production facility in the USA. Flame spread as tested is 20, under UL 723 / E-84 Tunnel test, and also exhibits a rating of 165 smoke generation with zero fuel contribution. Water absorption is 0.09 and can be used at continuous service temperatures of up to 160 degree C.
See the chart below for all characteristics that are important to proper functioning and extended life of the fume hood cupboard. Full sheets are available in oversized 48" x 96" or 1220 x 2440 mm and in thickness' of 3/16" and 1/4"
(4.76 mm and 6.00 mm) respectively. Minimum order requirements are requested for the supply of sheet materials.